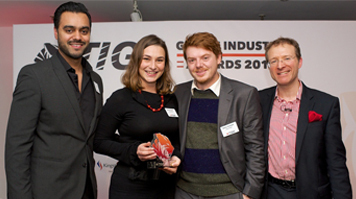 Games Design graduate Roberta Saliani and co-founder Danny Goodayle, have won the most outstanding start-up company award at the TIGA Games Industry Awards 2014. TIGA's Games Industry Awards focus on the best games and companies in the industry over the last 12 months, highlighting best practice and rewarding contribution to long-term innovation. Just a Pixel was selected from a shortlist of five leading start-ups in the UK, which all demonstrated a significant amount of originality. Roberta's innovative vision for Just a Pixel, partnered with her creative flair, gave the company an edge over its competitors. The annual awards ceremony took place at OXO2, a stunning venue overlooking the River Thames. On winning, Roberta said: "Winning a prestigious award in a category which reflects the nature of our company means a lot. It is an official recognition of all the effort that went into creating Just a Pixel and it is truly gratifying." After graduating from London South Bank University (LSBU) in 2012 with a first degree in Games Design, Roberta started Just a Pixel with a focus on games and mobile application development. After the first year of trading, the company developed applications for major technology companies such as Sony, CBBC and Activision. LSBU gave me a generalist knowledge of all the disciplines involved in game development, and we had the opportunity to be mentored by industry veterans. The BA (Hons) Games Design degree at LSBU was one of the first undergraduate courses in the country to offer creative and critical skills in video game design, development and analysis, rooted in a cultural and media studies perspective. The course is unique not only in that it is taught by professionals working in the games industry but in that it teaches students skills that are ahead of industry trends. "The course allowed me to form a hybrid skillset," said Roberta, "which is essential if you are planning on starting your own company. I hope I've inspired other LSBU graduates and students currently or considering studying the Games Design degree, and proved that hard work, determination and persistence will certainly get you ahead in this industry." Read Just a Pixel's top five lessons from their first year of running a start-up.